Kashi No Ki Kenyu Kai was founded by Trevor Chapman sensei, 6-Dan, in 1987. The dojo was officially named in 1988 by Yuji Nakata sensei, 8th Dan Kyoshi, whilst he was visiting England as an instructor with the All Japan Kendo federation. The dojo name roughly translates as ‘spirit of the evergreen oak, friends of the association’, a reflection of the dojo’s location in Sherwood Forest. After the passing of Chapman sensei in 2017, Phill Whitfield sensei, 3-Dan and long-time sempai at the club, became dojo leader. Kashi No Ki Kenyu Kai is dedicated to the development and promotion of kendo and brings a high level of understanding of the art to the locality. 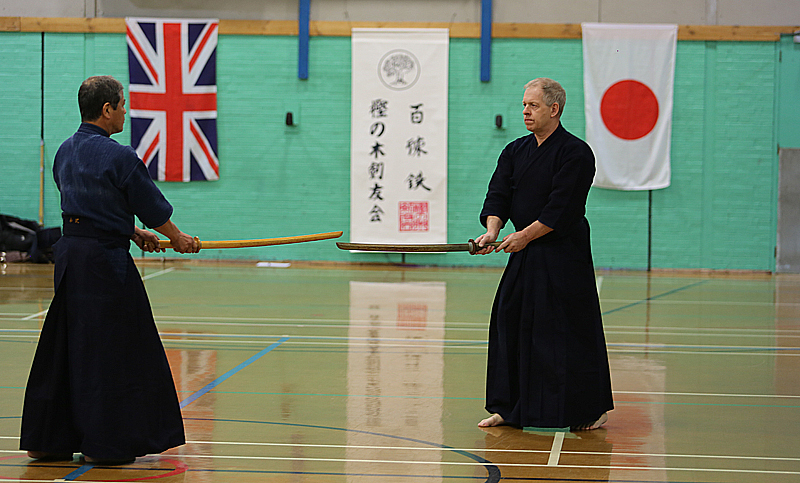 The club is a long established and a highly regarding centre for kendo, attracting some of the best Japanese and European teachers to the region to aid the development of British kendo. Our aim is to develop and promote Kendo by studying it through the very heart of its originating culture and core values. We aim to achieve this by providing club members with opportunities to learn from high-ranking Japanese teachers and qualified, DBS-checked national and international coaches. In 1990, the dojo was visited by Hiroshi Ozawa 8-Dan, author of ‘Kendo – The Definitive Guide’ and a highly respected kendo teacher who has since made an annual trip to the dojo to deliver a longstanding seminar attended by kendoka from across the country. We also host annual seminars with Junichi Tashiro, 8-Dan and owner of Tenpudo kendo supplies. Kashi No Ki Kenyu Kai is proud to be a not-for-profit organisation that provides the opportunity for people within the county to be exposed to the cultural richness that comes from the study of kendo. We constantly strive to improve our kendo skill and knowledge and to encourage and promote international relations through this complex and challenging martial art. Kashi No Ki Kenyu Kai believes in respecting it’s members no matter what their ability or disability – we are an inclusive club that that aims to enhance understanding and well-being through the practice of kendo. Students are allowed to progress at their own pace and to pursue kendo to the level and depth that they are most comfortable with. We understand the importance of providing a relaxed and safe environment in which to enjoy and develop whilst pursuing the art of kendo. Sensei Trevor Chapman with sensei Hiroshi Ozawa.